With metallic embellishments, this equal-area projection map take a note from vintage cartography. Antique mapmaking gets a much needed facelift with these upgraded prints of our modern world. Created by skilled cartographers from the United Kingdom, each map is printed on the highest quality silk-coated paper. Vibrant colors and metallic embellishments rival centuries of decorative and academic maps. Unlike traditional world maps, this model shows an equal-area projection which displays each country in its correct proportion to one another. Sea levels, rivers, and city populations are taken into account to create a realistic representation. 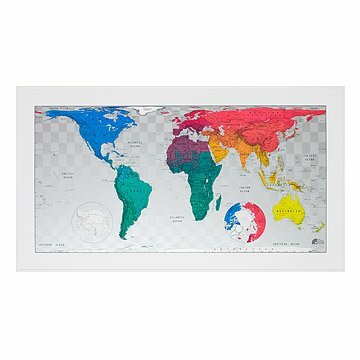 The map is coated with plastic and mounted on sheet metal to create a striking art piece that mounts with magnetic strips. Stainless steel balls are included with the print to mark places you've traveled, or to create a worldly memo board. Scale: 1:40,000,000. Made in the UK. Click here to see mounting instructions. Maps can be written on with a dry erase marker and wiped clean with a damp cloth. Map will arrive rolled in mailer tube. Each map comes with magnetic hanging strips to easily attach your map to the wall, 12 stainless steel balls to mark points of interest and 3 cylinder shaped magnets for attaching post cards or photographs. A very fine piece. Arrived quickly. Recommend. Arrived neatly packaged into a plastic tube and contains magnets and metal pins. Easy to put up on a (large) refrigerator door. Bought this for an 11th Anniversary present (steel) for a wife with wanderlust and she loved it... Although the only real "steel" part was the ball bearings to use as location markers. In any case, love the map, great gift. The picture and details regarding the product made me think it was going to be the perfect present for my husband... But not really. We both were very disappointed when he opened the gift. The presentation of the Continents and Countries are not of good quality, it looks like they are stretch out and deformed!!! I am returning it today :( Other gifts I purchased, although he was not very exited about them, he is keeping them. This'll go on our wall and help us mark our world adventures. It's really nice looking and way more polished than most maps you find. Really easy to mount.